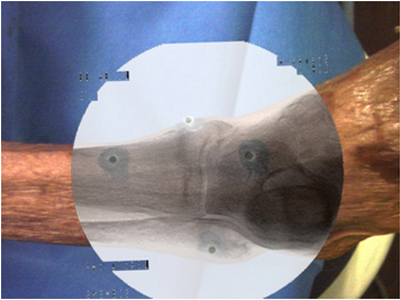 C-arm (X-ray source) motion estimation is a crucial step for many (computer aided) clinical applications, like X-ray image stitching, C-arm placement and so on. Most approaches are based on using X-ray images, and thus introduce additional radiation. Our Camera Augmented Mobile C-arm system is capable of acquiring the X-ray and optical image overlay, so the pose or motion of C-arm X-ray source can be computed using the information from optical images. This will definitely save a lot of radiation. Our current method for pose/motion estimation is using a planar marker pattern. The shortcomings are the difficulty of integrating this planar pattern into the clinical procedure and the limited viewed field to the camera. Therefore, using a flexible distribution of markers, in which markers can located in any 3D positions without any constraint, makes integration much easier and can provide an unlimited viewed field. However, using such a flexible distribution of markers will lose the 3D positions of each marker and thus the estimated translation is up to a scaling factor. We developed a novel method to recover this scaling factor. The main goal of this student project is to implement, evaluate and integrate the method. Your responsibility will be to implement the method of recovering the scaling factor, and evaluate and integrate this component into our X-ray image stitching and C-arm placement modules within close supervision by an interdisciplinary and international team. We have a mature library of computer vision algorithms implemented in C++ and matlab, including basic Matrix operations, various numeric methods, camera calibration algorithms, advanced pose estimation algorithms, DLT algorithms, 3D reconstruction and so on. You can definitely make use of these resources and minimize your coding work. Basic knowledge of 3D computer vision is recommendable . S. Benhimane, E. Malis: Homography-based 2D Visual Servoing. IEEE International Conference on Robotics and Automation, Orlando, USA, May 2006. Abstract: C-arm (X-ray source) motion estimation is a crucial step for many (computer aided) clinical applications, like X-ray image stitching, C-arm placement and so on. Most approaches are based on using X-ray images, and thus introduce additional radiation. 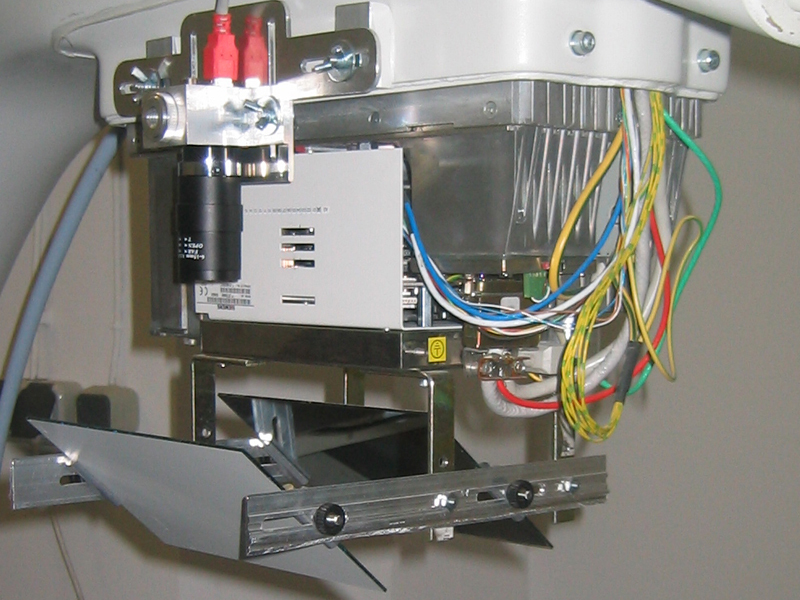 Our Camera Augmented Mobile C-arm system is capable of acquiring the X-ray and optical image overlay, so the pose or motion of C-arm X-ray source can be computed using the information from optical images. This will definitely save a lot of radiation. Our current method for pose/motion estimation is using a planar marker pattern. The shortcomings are the difficulty of integrating this planar pattern into the clinical procedure and the limited viewed field to the camera. Therefore, using a flexible distribution of markers, in which markers can located in any 3D positions without any constraint, makes integration much easier and can provide an unlimited viewed field. However, using such a flexible distribution of markers will lose the 3D positions of each marker and thus the estimated translation is up to a scaling factor. We developed a novel method to recover this scaling factor. The main goal of this student project is to implement, evaluate and integrate the method.